Pamplin Media Group - Could Vanport Flood happen again? Could Vanport Flood happen again? Portlander don't have to wonder if the city will ever face devastating flooding as Houston endured last August. That's because we already did during the 1948 Vanport Flood, when Oregon's second-largest city vanished hours after the Columbia River levee system failed. This area's flood-control system has improved since then, but a new state study shows just how vulnerable we are should the levee system fail again. The starkest finding is that if the levee failed near Portland International Airport, that could result in $1.4 billion lost wages the first year, and more than 24,000 jobs could be lost for a year — if not forever. Job losses would disproportionately harm people of color — an eerie parallel to the thousands of African-Americans displaced by the Vanport Flood. 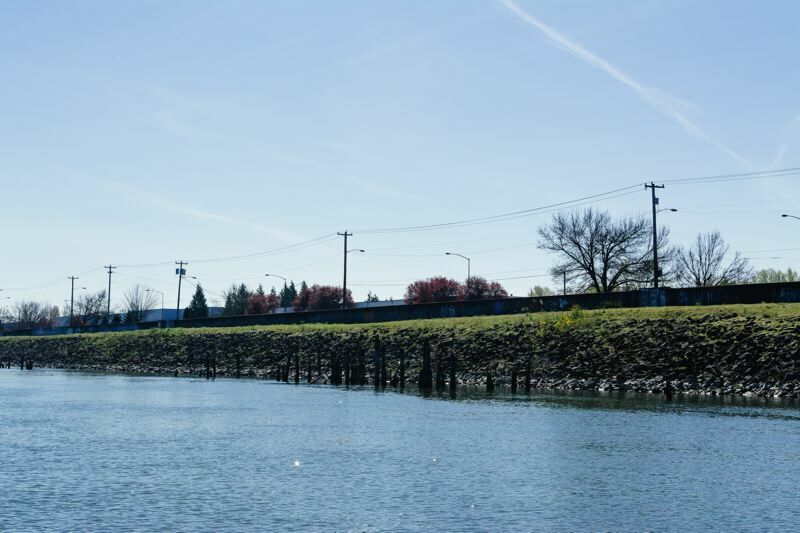 "That parallel is absolutely there," said Corky Collier, executive director of the Columbia Corridor Association, and a board member of the Multnomah County Drainage District, which operates the levee system. A large share of the middle-income jobs held by people of color in Portland are based in the Columbia River floodplain protected by the levee system, Collier notes. "The biggest problem that we've had over the years is that the levees have been out of sight, out of mind since the Vanport Flood," said Jules Bailey, convener of the Levee Ready Columbia project that's working to bolster our flood-control system. But the scientific findings in the state's new flood-risk assessment make it seem more real, said Bailey, a former Multnomah County commissioner and state lawmaker. 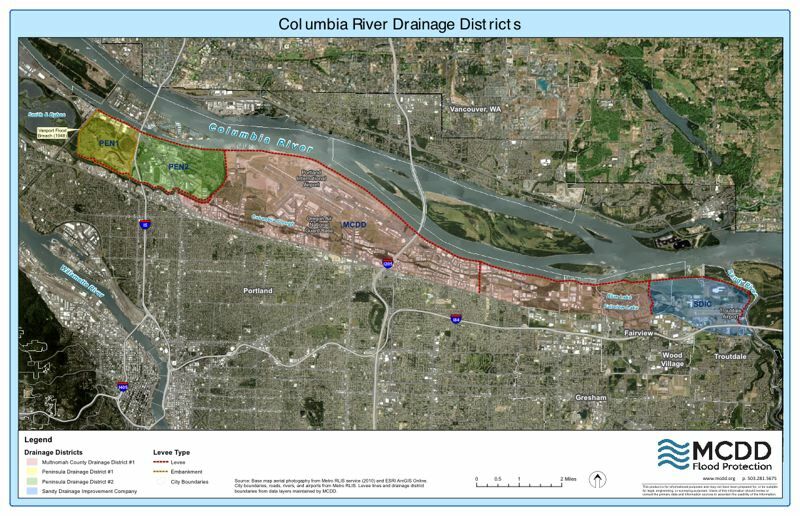 • Nearly half the 8,000 people living in five drainage districts south of the Columbia River from Troutdale to Sauvie Island are vulnerable to being displaced if nearby levees fail. Each district has its own earthen levees, creating giant "bathtubs" that could fill with water so flooding won't spill into the other districts. • Though residential development has been restricted since the Vanport Flood, $8 billion in property is now protected by the levees, including manufacturing, shopping centers, hotels, Portland International Airport, Portland-Troutdale Airport and the Oregon Air National Guard base. A levee failure near PDX would cause an estimated $2.2 billion in damage. • More than 1,000 inmates at Multnomah County Inverness Jail and Columbia River Correctional Institute could be displaced if nearby levees fail. • More than 1,000 sites in the floodplain contain hazardous materials, including 775 near PDX. • Interstates 5 and 205 could be impaired if the levees failed, as would Marine Drive, which sits atop the main east-west levee. The $80,000 study, to be formally released in March, was prepared by the state Department of Geology and Mineral Industries and funded by the Federal Emergency Management Agency, or FEMA. In 2016, FEMA released a more-sophisticated version of its Hazus software, which incorporates "real-world" impacts of past floods across the U.S. That enabled the state geology agency to conduct the nation's most detailed look yet at a levee system, down to the building level, said Christina Appleby, a geohazards analyst with the agency and lead study author. The draft findings, presented at a recent Levee Ready Columbia meeting, calculate the impacts of a flood that has a 1 percent chance of occurring any given year, also known as a 100-year flood. The final study also will look at the impacts of a flood with a 0.2 percent chance of occurring each year, also known as a 500-year flood. A 500-year flood would be more devastating than the preliminary numbers show, and Portland has already experienced two such floods in the past 124 years, in 1894 and in 1948, plus "100-year" floods in 1956, 1964 and 1996. Scientists say climate change is already causing more frequent and intense floods and other extreme weather events, such as the 2017 hurricanes that ravaged Houston and Puerto Rico. In the Columbia River system, floods are triggered by heavy rainfall and rapid snow melt. "What we are seeing are peak events that are closer together," said Sara Morrissey, program manager for Levee Ready Columbia, a coalition of governmental, business and environmental agencies. Climate change means the river is prone to remaining at a high stage for longer than before, she said. "That saturates the levee, where you're seeing more erosion or slope instability." Levee Ready Columbia leaders note that the Portland area has done a better job than most U.S. cities at keeping up its levees. "We do have a good levee system that protects the area well; it's robust," said Reed Wagner, executive director of the Multnomah County Drainage District, which uses property taxes collected by several drainage districts to manage the system. In the 1996 flood of the Willamette River that imperiled downtown Portland, the Columbia River levee system ably protected the floodplain south of that river. 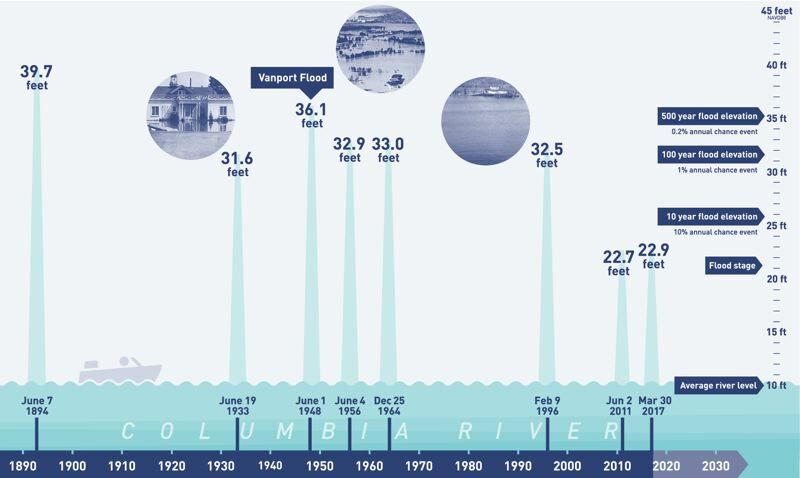 Since Vanport, there have been huge advancements in how the Columbia River is managed, including a joint agreement with Canada to control the flows and height of the river via dams. But FEMA and the U.S. Army Corps of Engineers are imposing stricter federal requirements for certifying levee systems as safe, which emerged after Hurricane Katrina devastated New Orleans. That prompted formation of Levee Ready Columbia, which commissioned engineering studies to determine weaknesses in the levee system in order to win federal recertification of the system. Those studies have shown perhaps $60 million to $80 million in improvements are needed to get the levee system certified, which is essential for property owners to qualify for flood insurance. Local drainage districts lack the resources to pay for the system to meet the new standards, project leaders say. For example, some giant pumps used to drain flood water need to be replaced, and some stretches of the 27 miles of levees are not up to current standards. Ironically, the biggest-ticket item is an estimated $15 million to replace a railroad embankment in North Portland that does double-duty as a levee. That's the same railroad embankment that failed in 1948 and led to the Vanport Flood. But the new engineering studies point the way to the necessary improvements, if Levee Ready Columbia can find additional funding. "They're in the realm of solvable problems if we do this right," Bailey said.